AstraNetworks is a web & video communications PARTNER that helps you receive the HIGHEST VALUE from your investment. Phone meetings with remote workers, or multiple parties can be stressful or even useless. When you’re not in the same room, it’s hard to know if you have someone’s full attention. Statistics show how valuable BODY LANGUAGE is to communication. That’s why, whether you need to stay in contact with mobile or remote colleagues, customers, or vendors, AstraNetworks offers room and cloud solutions for audio & video conferencing, web collaboration, and instant messaging. We help businesses of all sizes in the Rochester NY area utilize services such as live meeting, netmeeting and more. 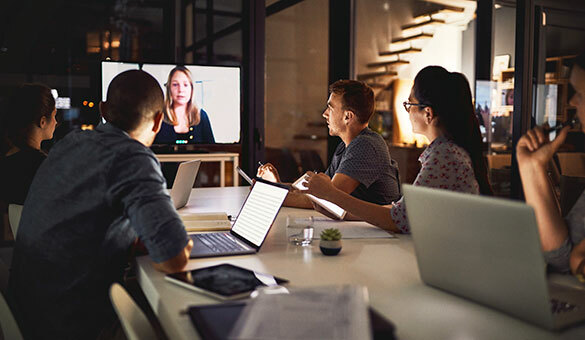 AstraNetworks provides an EASY-to-use, all-in-one CLOUD MEETING platform for video conferencing, group messaging, and document sharing called ZOOM. AstraNetworks uses POLYCOM video conferencing solutions because of their lifelike, dependable, and interoperable capabilities.